Why do I have to spend so much money on tools? Can I use tools that I already have? The hand tools you purchase are yours to keep and use throughout your professional career. Just as a musician becomes familiar with the nuance of playing a particular instrument, so you will become accustomed to using your specific set of tools. Professional quality tools are an essential component to doing professional quality work. If you already have tools, the instructors can inspect them and tell you which ones, if any, are appropriate for our program. Pay varies across the country. Entry levels jobs in Band Instrument Repair range from $12-$18/hour and guitar runs from $10-$14/hour. After a repair person has gained experience, earnings may be based on a commission or percentage (usually 50-60%) of the shop rate for labor charge. The College Learning Resource Center maintains a list of current job openings for all the programs and will mail them out to graduates. 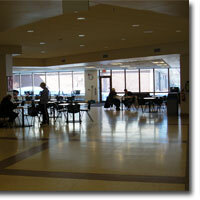 They will also help students write a resume and do mock interviews to prepare you for the job search. Since most coursework is hands-on in the lab, most of the work is completed during class hours. However, you should plan on a few hours of homework per week, including reading assignments and written work. Is there financial aid or work study available? 75% of the students enrolled in Minnesota State College Southeast receive some sort of financial aid in the form of loans, grants or work study. See the College’s Financial Aid page for more information. Do I need a car to get around Red Wing? Many students will find they need a car. The College campus is located three miles from downtown Red Wing. There are apartment buildings within easy walking distance. However, you will need transportation for grocery shopping and other errands. The Red Wing campus is also served by established bus service routes through Hiawathaland Transit. Check their website for information about rates and to download a service/route map. Tokens and monthly passes are available for sale at Walmart and Red Wing City Hall. For more information, call Hiawathaland Transit at 866-623-7505.